Fouquet (or Foucquet), Jean (c. 1420-c. 1481). The outstanding French painter of the 15th century. He was born at Tours and is known to have been in Rome between 1443 and 1447, when he painted a portrait, now lost, of Pope Eugenius IV. Much has been made of this Italian journey, the influence of which can be detected in the perspective essays and Classical architecture of his subsequent works, but the strongly scrulptural character of his painting, which was deeply rooted in his native tradition, did not succumb to Italian influence. 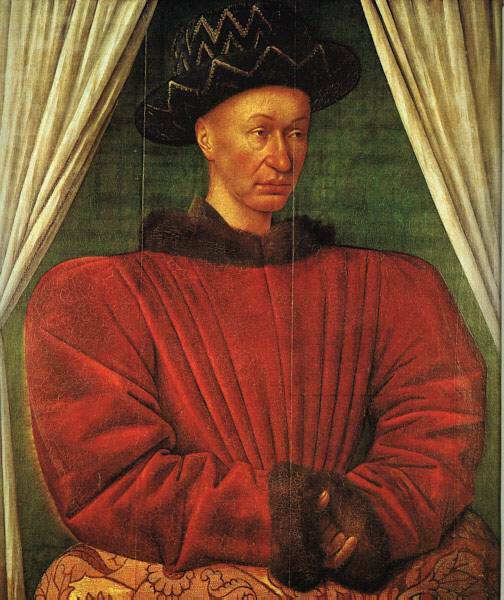 On his return from Italy Fouquet entered the service of the French court. His first patron was Etienne Chevalier, the royal secretary and lord treasurer, for whom he produced a Book of Hours (1450-60), now dismembered but mainly in the Musee Conde at Chantilly, and who appears in the Diptych of Melun (c. 1450), now divided between Antwerp (Musee Royal) and Berlin (Staatliche Museen). The Virgin in this work, at Antwerp, is rumored to be a portrait of Agnes Sorel, Charles VII's mistress, whom Chevalier had also loved. 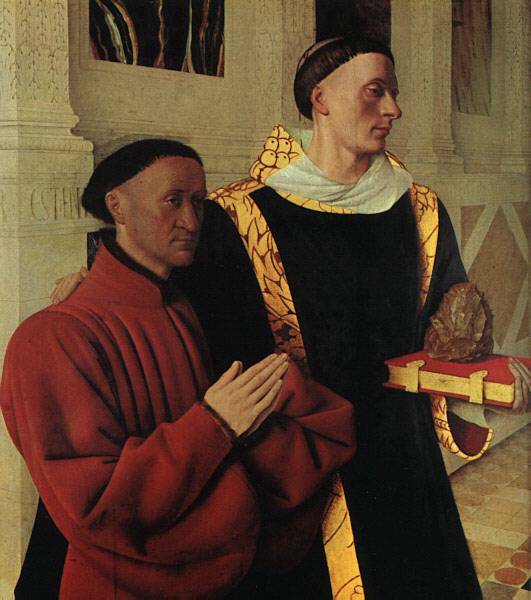 It was not until 1475 that Fouquet became Royal Painter (to Louis XI), but in the previous year he was asked to prepare designs for the king's tomb, and he must have been the leading court artist for many years. Whether he worked on miniatures or on a larger scale in panel paintings, Fouquet's art had the same monumental character. His figures are modelled in broad planes defined by lines of magnificent purity. He was essentially a draughtsman, and it was his drawing that imparted to his compositions their balance and clarity. His sculptural sense of form went with a cool and detached temperament, and in his finest works the combination creates a deeply impressive gravity.